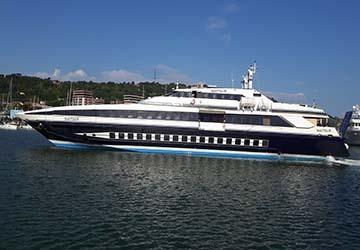 Linking the two countries in little more than three hours, Gomo Viaggi uses fast catamarans for the numerous, picturesque routes, offering some of the quickest ferry transportation in the region. Building on the original vision of providing locals with easily accessible holidays on both sides of the Adriatic, when the company was established in 2003, Gomo Viaggi has since increased their number of destinations to now include Cesenatico and Pesaro in Italy, and Rovinj, Mali Losinj, Zadar and Rab in Croatia. Rovinj, a fishing port on the Istrian peninsula, boasts a hilltop chapel and a stunning old town, while the offshore islands and archipelagos are known for their crowded, terracotta-roofed houses and beautiful cobbled streets. The Croatian coast is also steeped in medieval history and fringed by scenic beaches, making it one of Europe’s top summer holiday destinations. With directferries.co.uk you can find Gomo Viaggi timetables, fares and book Gomo Viaggi ferry tickets. Where applicable we’ll also compare Gomo Viaggi with alternative ferry companies.